Hi again! Earlier this month we shared a tutorial on making your own cupboard door serving tray here at Creative Home. With Easter coming up this weekend, we thought an easy Easter mason jar centerpiece would be perfect to go along with the tray. Read on to make your own. Supplies needed are 3 mason jars, a scrap of gray felt, 3 colors of bakers twine, 3 doilies and 3 pink pom poms for the tails. 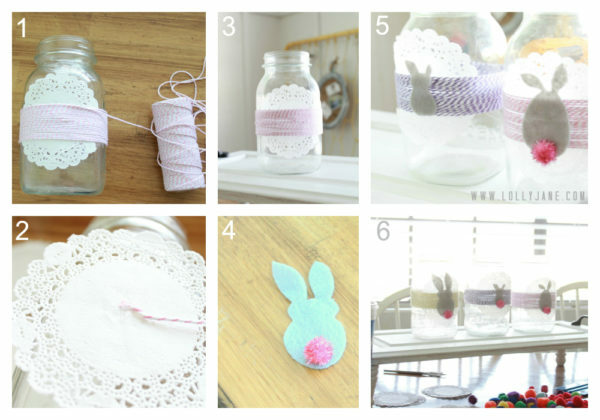 Using glue dots, place one on the center of the jar and place a doily on top. 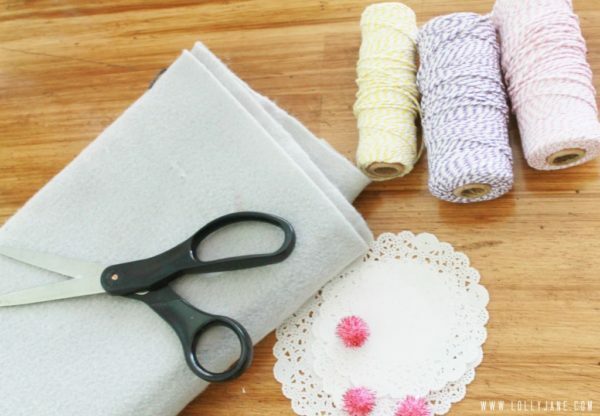 Stick another glue dot in the center of the doily and wrap your bakers twine around several times. Take a third glue dot and again, stick it in the center. For the bunnies, we free handed 3 different sized cuties and place them on the glue dot. Finally, glue dot a pink pom pom tail to your new family of bunnies. We filled our jars with fresh tulips that will compliment our Easter centerpiece and last into spring. Aren’t those little bunnies adorable? My kids got a kick out of them and my 3 year old even named them Carrot, Numbers and Brocoli, lol! Be sure to pop by Lolly Jane for more tutorials! Happy Easter! I really love how well the yellow tulips match your yellow walls. It looks like the epitome of spring in your home!